Travis has been part of the Guardian Security System’s family for almost 30 years, with 18 of those years spent in the field as a technician. Ten years ago, he designed and managed the Bravern; the largest smoke control project west of the Mississippi at the time. Q: If these professionals don’t know where to start, what’s their first step? A: The best advice I can give is to get to know your AHJ, which is the authority having jurisdiction over the building and fire codes of that area. Q: And how do people get to know their AHJ? A: That’s exactly what opportunities like our upcoming smoke control event are all about. Professionals in these fields will be able to meet and ask questions of the fire prevention authorities in cities throughout King County: Kirkland, Redmond, Bothell, Kenmore, Bellevue, Mercer Island, Renton, Newcastle, Issaquah, and unincorporated King County…all in all, we will have 10 to 12 jurisdictions represented. Q: Travis, what are some common misconceptions building professionals may believe about smoke control? A: Often, there’s a misconception about who should be involved. General contractors, HVAC professionals, electrical contractors, elevator control engineers and sprinkler contractors all need a working knowledge of smoke control in order to complete their projects. So do designers, architects, electrical contractors and mechanical contractors. They need to know what goes into smoke control, because it’s a critical piece of completing their project. Q: Any final piece of advice for building professionals regarding smoke control? A: Yes. Talk to each other. Too often, everyone is concentrated solely on doing their own thing: HVAC, electrical, or whatever their role is. But when it comes to smoke control, we all have to work as a team. We can’t afford to be anything but a flawless unit. If there is a smoke event, my smoke control systems have to work, the sprinklers have to work, and the HVAC has to work so we can move smoke out of the area where it originated and keep it from spreading throughout the building. Everyone has to work together like a symphony in order to make it happen. If we’re doing it correctly, it becomes a very tight knit relationship that really benefits our clients. 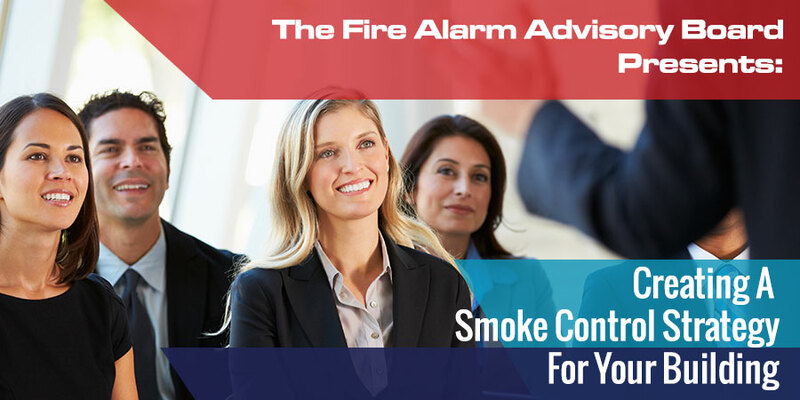 The Fire Alarm Advisory Board Special Sessions Smoke Control event will be held April 23 from 9:30 to noon at Redmond City Hall: 5800-15990 NE 85th St. For more information, contact Stassa Hansen, fire systems sales manager at Guardian Security: shansen@guardiansecurity.com.